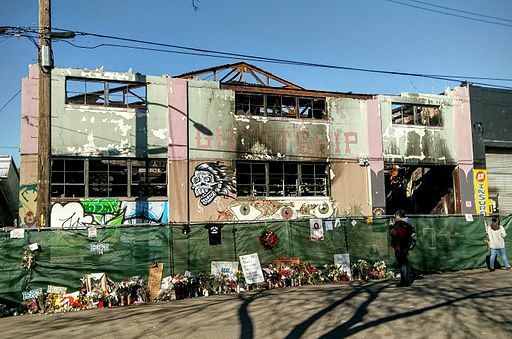 OAKLAND, Calif. (CN) – A state judge on Friday said there is enough evidence for a manslaughter trial to proceed against two men connected to the 2016 Ghost Ship warehouse fire that killed 36 people. Alameda County Superior Court Judge Kevin Murphy denied a motion to dismiss the charges against Ghost Ship master tenant Derick Almena and creative director Max Harris despite what he characterized as solid arguments by their lawyers. Murphy’s ruling backed up a magistrate judge’s December 2017 decision to try the case. Following the Dec. 2, 2016, fire that broke out during a dance party on the Ghost Ship’s second floor, Alameda County prosecutors charged Almena and Harris last June with 36 counts each of involuntary manslaughter for failing to ensure that the warehouse complied with fire and safety codes. Almena and Harris pleaded not guilty. Prosecutors say the building was a “fire trap” cluttered with flammable debris, lacking overhead sprinklers and emergency exits and that Harris blocked off one of its two rickety stairwells before the party. Nonetheless, up to 25 musicians and artists lived illegally at the Fruitvale-area warehouse, where illegal concerts were often held. Smoke inhalation killed most of the 36 who died, trapped on the second floor. A civil wrongful death lawsuit brought by family and friends of the fire’s victims also claims the Ghost Ship got its power from an adjacent building via an overloaded cable snaked through a hole in the wall. The lawsuit accuses Pacific Gas & Electric, one of California’s biggest utilities, of failing to investigate the dangerous power surges caused by the overloaded electrical line. The victims’ family and friends have also accused the city of Oakland of neglecting to inspect and shut down the Ghost Ship despite police and fire personnel visiting repeatedly before the fire and knowing it was unsafe, which Almena’s and Harris’ defense teams reminded Judge Murphy of on Friday. Almena’s lawyer, Tony Serra with Pier 5 Law Offices in San Francisco, said Oakland’s failure to close down the Ghost Ship warranted dismissal of the charges. He said police officers and firefighters never told Almena that the warehouse was unsafe. In fact, they told him it was “awesome,” Serra told the judge. Serra also argued that Almena couldn’t be prosecuted over the fire because investigators never determined its cause. He suggested a candle knocked over during a fight, a faulty transformer in an adjacent building, or arson as possible igniters of the fire. Curtis Briggs, a San Francisco attorney representing Harris, pointed out that the scene of the fire was never tested for arson. Instead, an investigator removed and destroyed the debris left behind. “They were focused on body recovery,” Briggs explained. “The crime scene was processed in a way…that caused the scene to not be preserved,” he added. Jurors will hear about the destruction of evidence at the criminal trial, which is set to begin July 16. Harris’ lawyers also argued the charges against him should be dropped because he didn’t block the second staircase the night of the fire. They said prosecutors ignored a witness’s testimony that Harris had not blocked it off. Alameda County prosecutor Autrey James disputed the defense’s arguments. He said police and fire employees didn’t know people lived at the Ghost Ship. Had they known, he argued, it “would have made a difference” to the decision to report the unsafe conditions. James also said the witness who testified the staircase hadn’t been blocked off also described pushing speakers out of the way to get back up to the party on the second floor. “It appears to me that that is blocking,” James said.